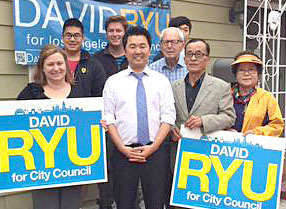 VOLUNTEERS join councilman-elect David Ryu following his victory for Council District Four. On July 1, David Ryu will take the oath of office to become City Councilman for the fourth district following his victory in the May 19 election. Ryu, who defeated Carolyn Ramsay by 1,600 votes in the race to replace Tom LaBonge as councilman, will govern an area from Sherman Oaks to Miracle Mile. His victory was attributed to strong support from the Hollywood Hills and San Fernando Valley. Ryu, 39, will be the first Korean American to sit on City Council, and only the second Asian American after Mike Woo, who served until 1993. On election night, Ramsay thanked her hundreds of supporters for “our clean, positive campaign about improving the city.” A former chief of staff for LaBonge. she received endorsements from City Council president Herb Wesson and other council members, City Attorney Mike Feuer and Mayor Eric Garcetti. Ryu’s campaign dwelt on the “outside versus insider” theme, portraying him as someone who could shake up city hall. LaBonge has held the office for 14 years, and has been termed out. A former senior deputy to county supervisor Yvonne Burke, Ryu recently was director of development, government, and public affairs at Kedren Community Health Center. He said the key issues affecting the district are access, accountability and responsiveness of elected officials as well as improving streets and infrastructure. Ryu majored in economics at UCLA, studied public policy and administration at Rutgers, won an United Nations graduate internship; and was a fellow at USC.